Joy has been a goat lover and cheese lover for 20 years. She enjoys experimenting with making her own cheeses and dairy products. Good mozzarella cheese is easy to make. It's versatile, and fun. It takes only fresh milk, some common kitchen tools, two special ingredients, a bit of curiosity, and about three hours of time. Cheese making is a learned skill, and, while not difficult, it does take a certain amount of precision and forethought. A light-hearted attitude is a bonus, as even the most careful treatment sometimes yields a different product than you were after. 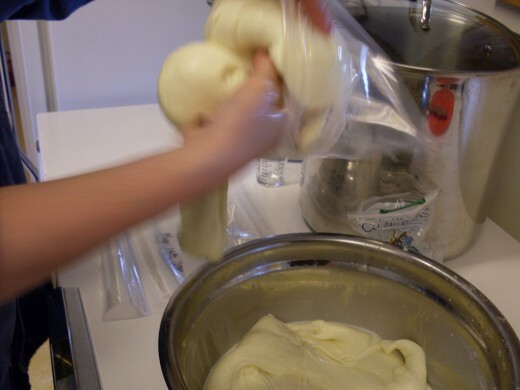 I like making mozzarella because it is relatively quick, and it is hard to screw up. The rennet is missing from this picture. 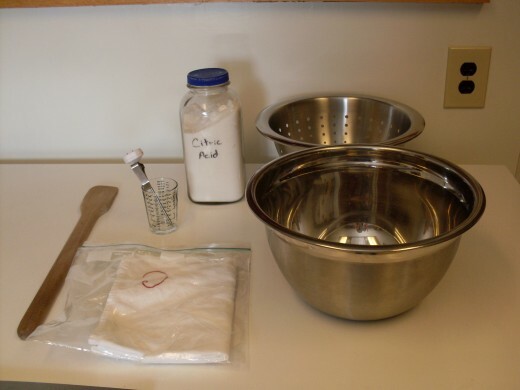 The citric acid is the white powder in the jar. I keep special towels for cheese making, and mark them with an embroidered "C". Mozzarella cheese goes together in three separate stages. Begin by collecting your supplies. 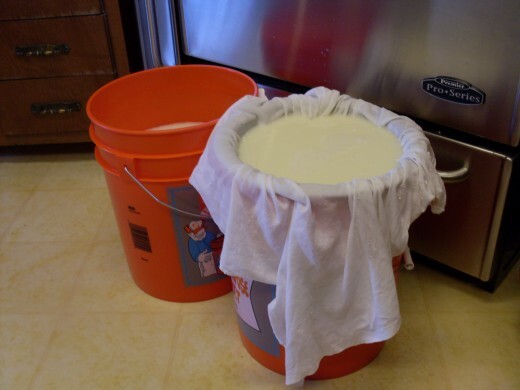 If you choose to work with more than two gallons of milk at a time, and plan on making cheese often, I also recommend a food-grade five gallon bucket with a lid. It is nice if your collander fits over the rim without falling in. 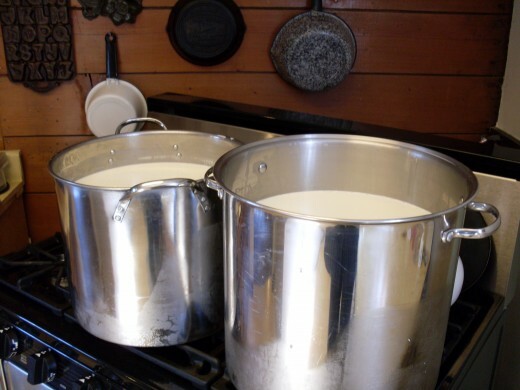 About 9 gallons of milk, divided between 2 five-gallon pots. This is my usual amount. Yours may be less. Begin with chilled milk, and skim the cream from off the top. Reserve it for making butter. Unless you have mechanically separated the milk from the cream, there will still be a fair amount left in the milk. This is fine. 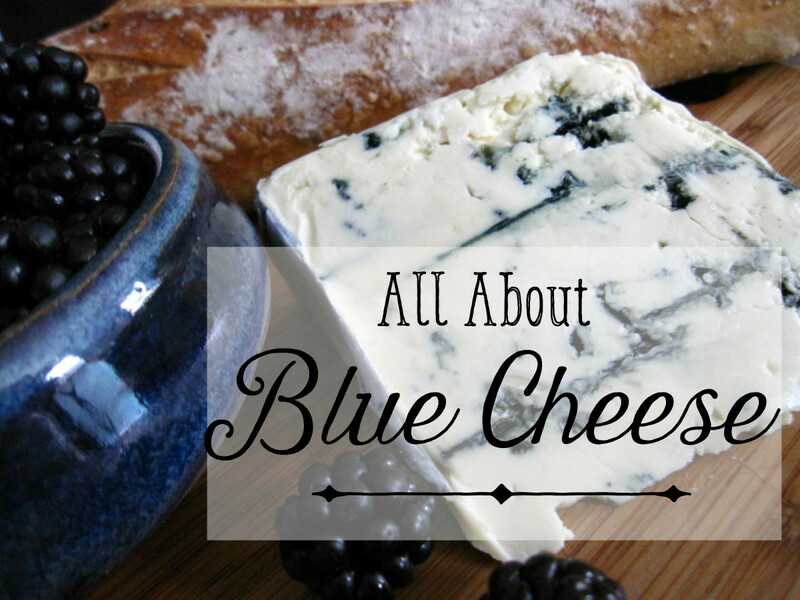 A little is good, and enhances the texture and flavor of the finished cheese. Too much remaining, however, is a waste of the cream, as most of it runs out in the whey. Pour the cold, skimmed milk into the stock pot(s), and set it to heat over a low flame. Clip your thermometer over the edge of the stock pot, where you can keep an eye on it. Your first goal is to bring the milk slowly to 88 degrees F.
Stir occasionally, but thoroughly, reaching clear to the bottom of the pot(s). While the milk is heating, measure out 1 1/4 teaspoons citric acid powder per gallon of milk, and sprinkle over the top. Some people prefer to dissolve the powder in a little cool water, before mixing it in. Stir thoroughly. I am working with between 8 and 9 gallons of milk here, so I added 6 1/2 teaspoons of citric acid powder per pot. The purpose of the citric acid is to sour the milk. It is possible to substitute lemon juice (don't use vinegar...it doesn't have the right kind of acid), but I find this makes the finished product stringier and a bit harder. Once the milk reaches 88 degrees, stir 1/2 teaspoon liquid vegetable rennet per gallon of milk (or it's equivalent in other rennet), into 1/4 cup cool drinking water, and add to the milk. Stir thoroughly. You don't need to increase the amount of water if using less than a couple teaspoons of rennet...the point is to make it mixable. Turn the flame off and allow the milk to set for 15 minutes to coagulate. Testing the curds for degree of coagulation. Cutting the curds into a grid, so they can shrink. After 15 minutes, the milk solids should have come together into a smooth mass of curds. They should be firm enough that when you dip your finger into them, they should break cleanly, and whey should fill the depression. With the long knife, cut a grid of 1" vertical strips. Cutting the grid allows the heated whey to strengthen and harden the curds. With mozzarella, I usually just cut vertically, but if you wish to be correct, you ought to cut horizontally, too, to form cubes. 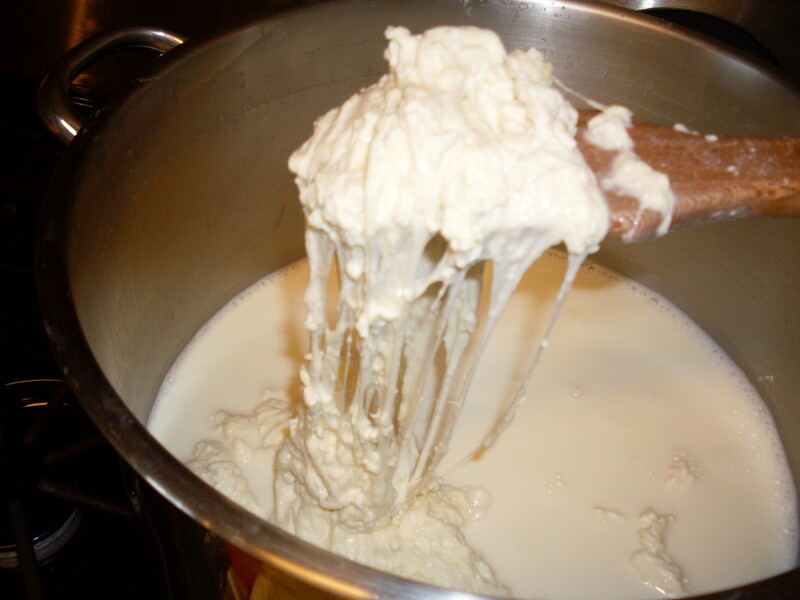 Some cheeses require this to form proper curds. Allow the curds to rest for 10 minutes. These curds have shrunk some. 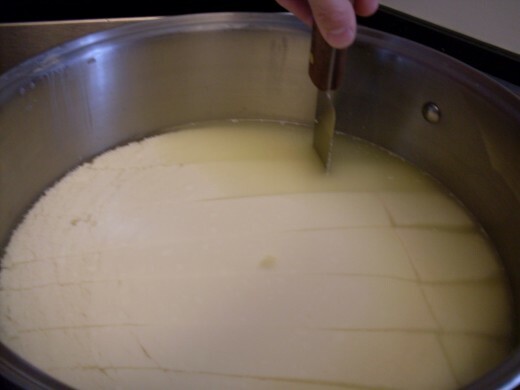 This is what the strips of curds look like, once they have been heated a little. The specks are pieces that broke off the strips. Draining the whey. This is whey from my second pot...the first bucket is already full of whey, and ready to be used for other things. In the bottom of the colander may be left a few ricotta-like curds. These are good lightly salted. Turn on the lowest flame, and bring the curds slowly to 108 degrees F. This will shrink the curds, hardening them somewhat. 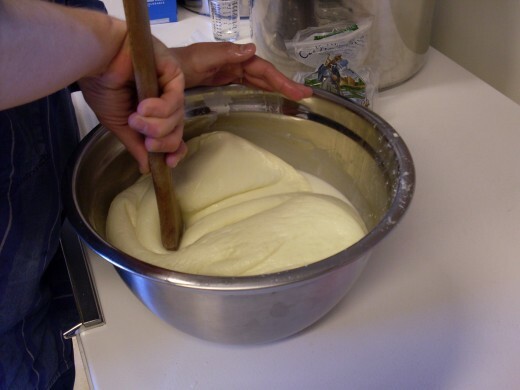 Don't stir much at first, and when you do, stir slowly, so as not to break up the curds too much. The idea is just to circulate the heat, and make sure nothing is sticking to the bottom of the pot. 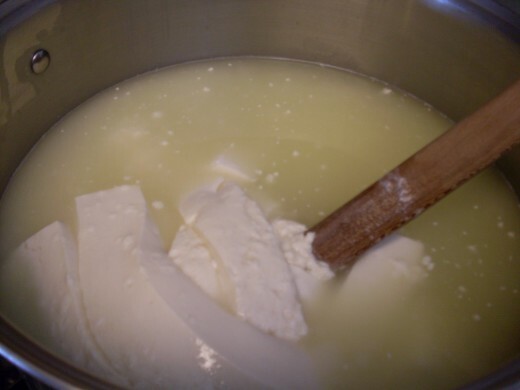 If you break the curds into little pieces, it is harder to drain the whey off in the next step, and being broken up too much can prevent some of them coming together and getting their "stretch", in Stage Three. Keep the curds at 108 for 35 minutes. The harder the curds become, the more you can stir, but always be gentle. 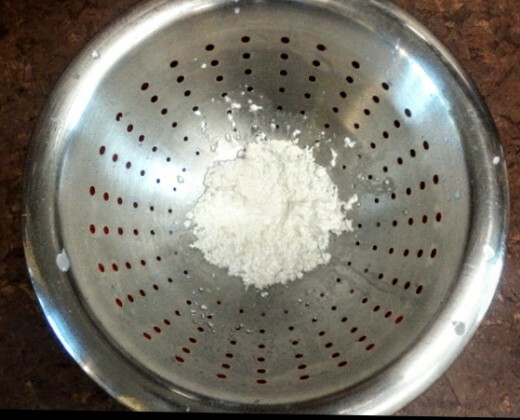 Set up your colander in a large bowl or over the five gallon bucket, and line it with a clean tea towel. 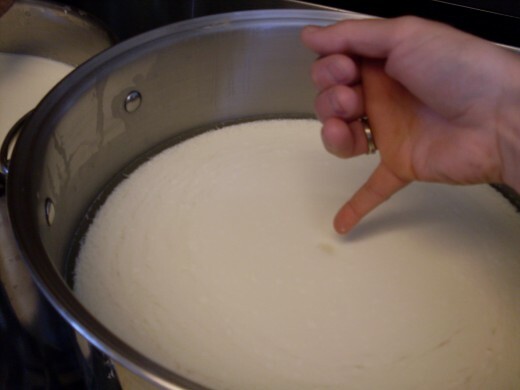 If working with a small quantity of curds and whey, lift the pot and pour off the whey. If nothing is stuck to the bottom of the pot, it is not necessary yet to pour the curds clear out. You can leave a bit of whey with them, as you will want some in Stage Three. If working with a large pot of whey, take any handy, clean container and dip out as much whey as you easily can into the colander. I like to use a Pyrex batter bowl. If you can see the curds in the bottom, leave the rest. If not, pour off the whey until the curds are just visible. If the whey in the collander stops draining, scrape the bottom of the towel with your fingers to remove the fine curds that clog it, or you can try lifting the towel to a different angle, to recirculate the "fines" enough to keep draining. I usually have to change towels if I drain more than 12 gallons of whey. A note about whey: It is sticky. If you splatter your stove, floor, or cabinets, water probably will not remove all of it. Dish soap helps. Besides being sticky, whey is nutritious...but it's not very palatable. You may drink it if you wish, or you can save some of it and feed it to your pets. Cats, dogs, chickens, goats, and calves usually like it. But be aware that large quantities of it will give them the runs. These mozzarella cheese curds are not stretchy enough. These curds are done! They are stretchy, and "sheet" nicely. Hm-hm! 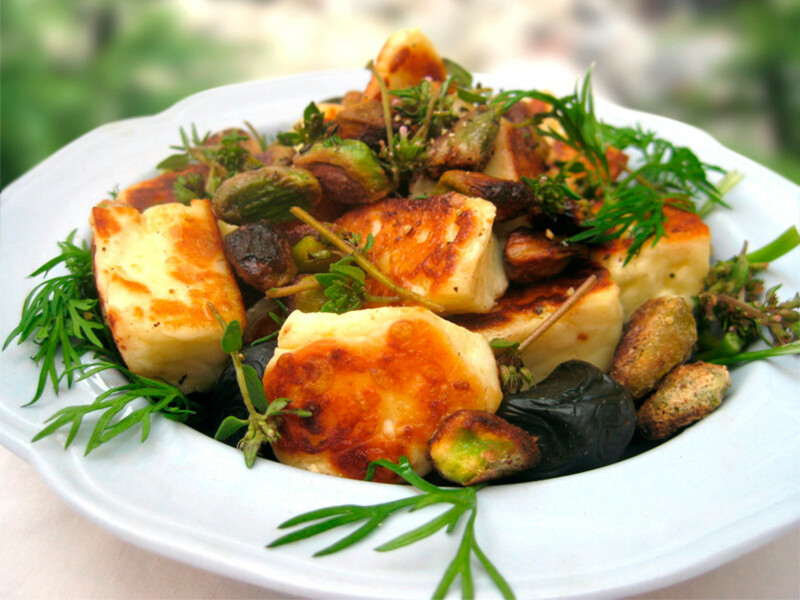 Now, you are ready to heat your curds yet further, and make them into stretchy mozzarella cheese. 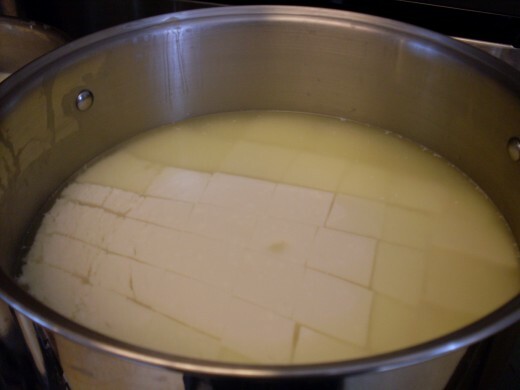 If you have two or more pots of curds, put the curds together in the cleanest pot, with whey barely to cover, and turn on the lowest possible flame. A double boiler is even better. On the chance that your whey has become contaminated...say, your two-year-old decided to stick her dirt-laden arm in up to the elbow, or your dog came by and began lapping it out of the bucket...don't despair. You can use water for this stretching process. Heat it in another container, and pour it hot (not boiling) over the curds. The curds should mostly be in a mass by now, or at least in fist-sized chunks. Aim for a temperature of 140 degrees F. or more. I've seen as high as 155 degrees recommended, though I find that this makes for scorched curds. You may want to use two spoons for this process...one large regular spoon, and one large slotted. I prefer just one...the same long wooden one I've used throughout the process. 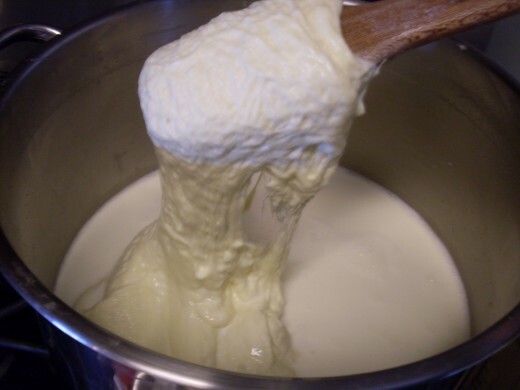 Once the whey begins to heat, turn the curds over on themselves often, like kneading. They will form into a mass, and begin to melt together. The important thing is to keep them from scorching. With your spoon(s), pull the curds out of the whey, and stretch, like taffy. Once they get hot enough, the stretch comes quickly. You will see them change from lumpy and almost fibrous, to smooth and stretchy. When they cascade from your spoon in a sheet, and begin to look shiny, they are done. For Big Lots Of Cheese, To Be Used Quickly! Dividing the cheese lump in two, so it will fit nicely in two one-gallon bags. Loading the bag. Work quickly...the cheese likes to stretch right out of your hands. Squishing the air out of the bag, and smoothing the cheese. I'm told that the word "mozzarella" means to "to pinch" [off balls of cheese]. Making balls from fistfuls of cheese would be the standard method of preparing the curds for use, and also allows for proper brining. If you prefer to do this way, simply divide the cheese into lumps which you can use easily, wrap each one in a square of plastic wrap, and store in a bag. I like to divide each batch into balls each big enough for an average meal, be it pizza, a casserole, a salad, or for chopping onto foods at the table. Balls also take less time to thaw, should you freeze them. Have ready whatever you intend to package your cheese in. If you intend to use Ziplock-type bags, label them with a permanent marker now, as you won't be able to once the hot, moist cheese is inside. Pour out as much whey as possible. Be careful of steam burns!...and use your spoon, if you don't have tough hands, to lift the mass of very hot cheese around on the inside wall of the stock pot, to drain any trapped whey. Once you've gotten out all you reasonably can, dump the cheese into the large bowl. Have ready whatever salt you intend to use. I prefer unprocessed sea salt. Sprinkle on some, then use your spoon to knead the cheese...sprinkle on more salt...knead it in. Do this until you are satisfied with the saltiness of your cheese. You will have to work quickly, as the cheese stiffens as it cools. Some people prefer to place the cheese in a brine. If you want to do this, have ready a brine made of 8 oz. salt to 1 quart cold water. Shape the cheese into balls, and place in the brine for 10 to 30 minutes. The longer you leave it in, the saltier it will be. Remove from the brine, pat dry, and store. You can wrap it in plastic wrap, then place the balls in bags. Refrigerate for up to two weeks; freeze for longer storage. If you choose the sprinkle-and-knead method, two or three generous pinches of salt usually will do it, if you intend to use the cheese in main dishes, such as pizza or lasagna. For a snacking cheese, more salt is good. Once it is salted, lift the cheese into a storage bag, or roll handfuls into balls to cool. Since my family and I often use a lot of cheese at once, I prefer to place it in gallon bags, from which we can later cut whatever we need. Seal the bag, then smooth down the cheese, squishing it out to the corners of the bag. Note: 5 gallons of milk will yield enough cheese to nicely fill one 1-gallon bag. ...then scrub each section between your hands. Finish by wringing any remaining whey out of the towels, repeatedly if necessary. Clean out any curds left in the towel(s), using a knife to gently scrape them clean if necessary. 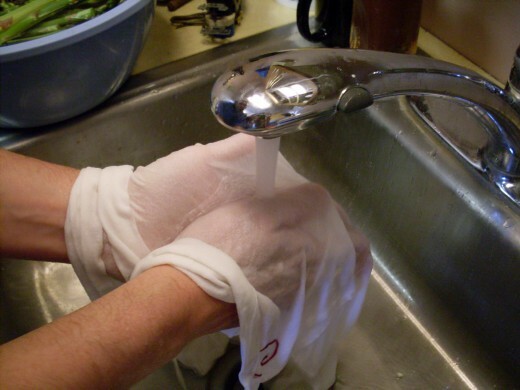 Bundle the towel(s) together, so as not to scatter whey or cheese particles, and lay them in a corner of a clean sink. 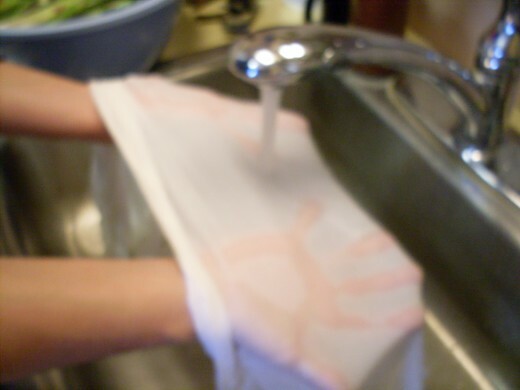 Immediately wash any pots and utensils...if you wait until they have dried at all, you will find it many times harder. Do any scorched spots first, and pay particular attention to rivets and other milk-trapping areas. Dry with a clean towel, if you wish, and set things where they can dry thoroughly before being put away, as any water left in the pots will exacerbate any smells left from the milk. If necessary, fill the pot(s) with bleach water and allow them to soak. Rinse out your towel(s) under cool running water, rubbing them together systematically between your hands, and either toss them directly in the washer, or hang to dry until you have a suitable load of laundry ready. After several years of making mozzarella as my main, quick cheese, I have developed some short-cuts. You may wish to adopt some of these. For starters, I stopped using towels, unless I have an extraordinary amount of fine curds left in a batch. In other words, a batch which failed to develop firm curds capable of achieving a good stretch. Normally, there is only a handful of ricotta-type curds left, which are mostly trapped by the colander. And I figure that if the goats and chickens who usually drink the excess why get a few curds, that is fine. Secondly, I no longer prepare such huge packages of cheese. My husband can no longer eat dairy, and this means that we're going through less than half the cheese we used previously. I prefer smaller packages, which are also nicer for giving as gifts, should I wish to share the bounty. Thirdly, I have developed a pretty good feel for the optimal temperature at which to treat most amounts and variations of curds, and can work the curds more quickly by using my hands as much as possible, and spoons less. Sometimes I need to keep a bowl of cold water handy so I can dip my hands a few seconds at a time, between bouts in the whey. I can't exactly describe for you this optimal temperature...but if you can find it, you will save yourself trouble. I can only describe it as "almost scalding" for someone with tough hands. The mozzarella-turned-ricotta. It melted apart, instead of together! Even though it is fairly foolproof, there is a chance that something may go wrong with your mozzarella. Out of perhaps 200 pots of mozzarella cheese I have made, I have only had it fail to turn out once. In this case, it fell back into particles during Stage Three, and became ricotta cheese. I spent much time speculating as to the cause, and finally concluded it probably was due to some colostrum that made its way into the milk I used. There is nothing wrong with this ricotta; it works as well as ever - for the things ricotta is good for. So, even a failure won't be a waste. Have you ever made cheese before? What is your favorite way to use mozzarella cheese? These large cotton towels are about 25"x30", and are just the thing for draining and hanging cheeses. Wow, somehow I missed your comment. I am so sorry! I hope your cheese turned out fine in the end, whatever you chose to do with it. As you probably already figured out, you should just be able to heat it, and get a ricotta or perhaps cottage cheese type curd. If it still didn't curdle, you should be able to add red wine vinegar or lemon juice or perhaps citric acid to make it do its thing. The great thing about cheese, is even when it doesn't behave (sometimes for reasons beyond our control), you still wind up with something edible most of the time. 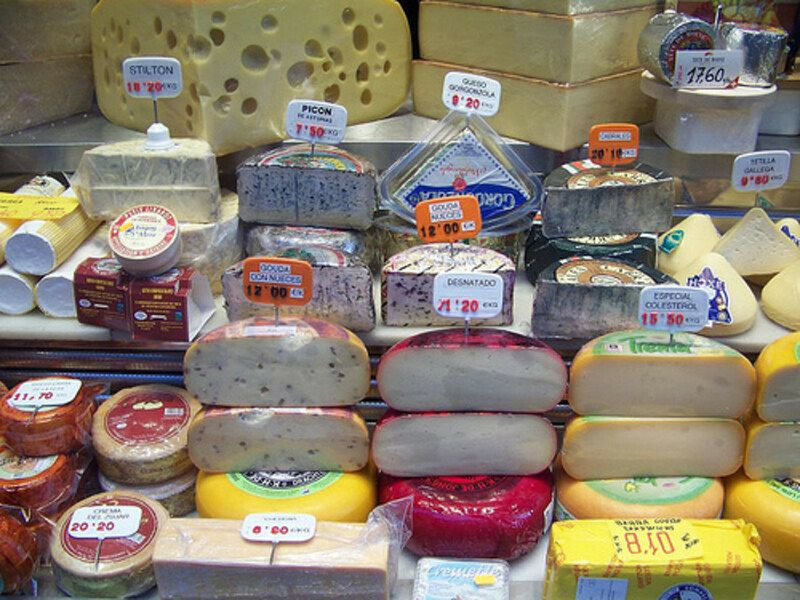 Cheese is cheese, as long as it's not directly contaminated by something known to be toxic, in which case it would be compost. For some reason after half hour of the milk sitting with the rennet it has not set. Should I wait a longer at this point or make it to ricotta? Also If this citric acid is already in the milk to make ricotta do I just heat it? Or have to add more acid? Thanks for the compliment on the article! I also enjoy cheeses made with vinegar. There are several nice kinds based on vinegar...some recipes of which I plan on publishing here. (Drafts are written on some...time is the determining factor.) So glad to have met you! I have a Nubian milk goat, and her milk is awesome. I make a soft cheese with just vinegar and it's really yummy. 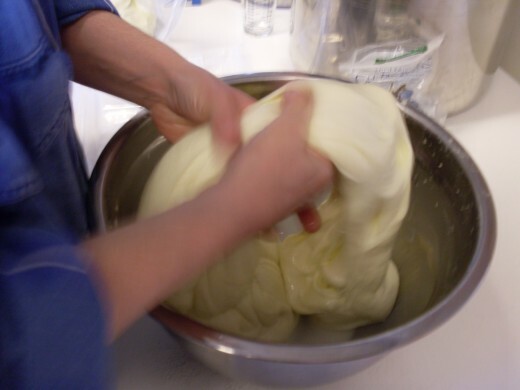 I may have to get some rennet and citric acid so I can make some mozzarella! Great hub! Voted up! My commenting will not always be this prompt. I take a couple of days a week to check comments. But I am glad to hear from you again. We, too, enjoy gardening, and have kept poultry of various kinds. Every day shows me fresh wonders. I believe God meant us to be able to keep animals, and stay close to the dirt. That's what God does for us through our garden. He teaches me sooo much about life and His original intentions for us. We've recently moved up to chickens, ducks, and rabbits. We live in a suburban neighborhood though, so we have to be careful of restrictions. I love living off of God's provisions, instead of being wholly dependent on the grocery store. They can indeed be wonderful creatures. Some of my best memories involve goats. They taught me a lot worth knowing about life and love. Some cultures are very temperature-specific. 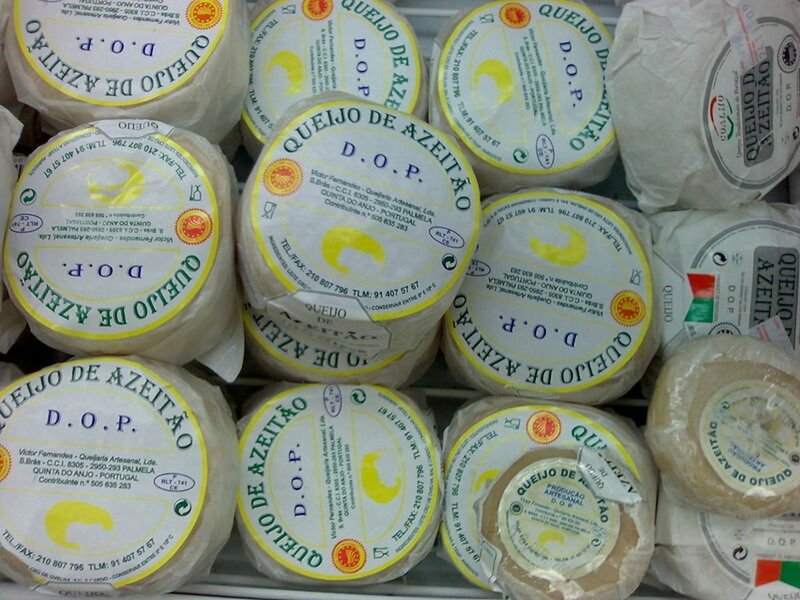 So it is possible that overheating your milk may have caused your cheese to fail. Definitely invest in an accurate thermometer, for future projects. It will save you many headaches. Good luck! There are a number of things which may have gone wrong, but I'm going to take some shots in the dark, and let's see if we can't get this worked out. First, let me hasten to say that I've had a number of cheese failures over the years - mostly with mozzarella, due to the regularity with which I make it - and almost no cheese is a waste. You can almost always drain the curds and use them somehow - in this case, much as you would cottage cheese, ricotta, or fresh cheese of any kind. Are you sure your milk did not contain any "extra" bacteria? - such as happens with naturally soured milk, or any kind of contamination. Most of my "failures" have been due to unintended bacterias, I think. I attempted to make mozzarella for the first time yesterday. I used raw goat milk I had frozen and thawed. I was following a recipe that used 3 gallons of milk, but when I started measuring, I discovered that my largest stainless steel cooking pot wasn't large enough for the last 6 cups, so I went and bought a stainless steel stock pot with lid. I followed those directions but kept getting interrupted by other children demands and in the end, my "cheese" never formed into the large mass of curds that could be cut. 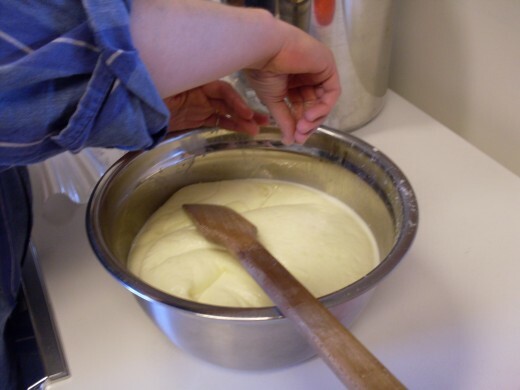 It is still soupy with small curds like when you make ricotta. I used double strength vegetable rennnet, citric acid, and culture. Any ideas of what went wrong and can it be saved? I hate to toss 3 gallons of goat milk! Oh, I wouldn't actually throw it out, but what can I do with it? I am very disappointed but not giving up by any means. I only have a candy thermomoter and I wonder if the temp getting up to a hundred and then cooling down before adding the rennet could have ruined it. Good! Let me know how your cheese turns out, and what rennet method you chose to use. I'm curious. Thank you. Your reply was very helpful and the link too. Simply put, rennet is the substance that causes milk to curdle. There are animal as well as vegetable sources. It is included in the stomach lining of very young animals who have never eaten anything but milk. 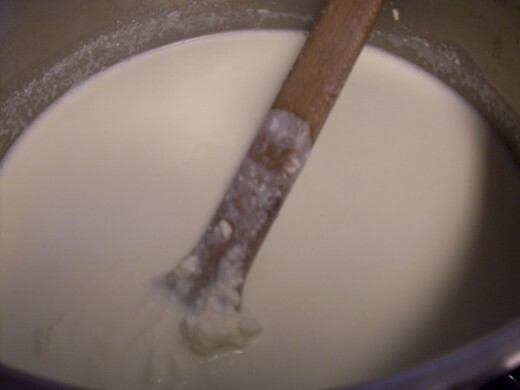 If using rennet from this source, simply cut up the stomach lining into small squares (1 inch, say), and tie a piece into a muslin bag, to be added to your pot of milk. Vegetable sources include various plants, growing wild many places, and I'm sorry to say that at the moment, most of the names of these plants are escaping me. However, one I do know of is common purple thistle. You can put a thistle head (after the plant has gotten through the colorful stage and begun to turn brown) into each pot of cheese - tied in a bag, as for the animal rennet. Both of these methods may cause your milk to take longer to curdle than with commercial rennet - instead of a few minutes or hours, you may have to wait overnight - but the process is still doable. I use goats' milk, starting with raw milk which has a moderate amount of cream left in it. You should be able to use whatever you have available, though. I love mozzarella cheese but we don't get rennet. What is it and can i use something else as a subsitute? What kind of milk do you use?? Cow's milk or goat's milk? thanks. Great and detailed hub. I have had some very interesting mishaps this year also...like you said, something in the air, as I have found no viable explanation for some of them. The mistakes have always been usable and edible, just...different. That's a good idea to cook the whey into additional cheese. I usually don't take the time, because it gets well used being fed to the chickens. Thanks for your troubleshooting comments! For the past 3 yrs I have been milking and making cheese (goats) and this year had trouble with it! Something in the air! Yesterday I got Mozz that was like ricotta too! By the way, when things go good I always drain my whey, from almost any cheese I make, and cook to 200 degrees, strain and have ricotta! Thanks for trying the recipe. I hope it works well for you. If it doesn't turn out to satisfaction, let me know and I'll try to help you troubleshoot. am trying this weekend. the recipe is well explained and hopefully i will be able to do it. this will be my first attempt as i could not find the raw milk before. will let you know. thanks a lot for sharing! I understand you not wanting to use the microwave! Even if it weren't for the health hazards, it changes the taste of the cheese...leaves it bland. Thanks for sharing your recipe and photos.. I have noticed that most recipes call for heating the cheese up in the microwave. Which i was not real crazy to do! but now with this website I will definitely have to try it! Thanks! Livelonger, please do. It's really not so hard, though it can be intense. I, too, have made ricotta, and I can't say that I think one kind of cheese is easier than another...they're just different. I plan on putting up recipes for more kinds of cheese, and, in fact, have several drafts started. 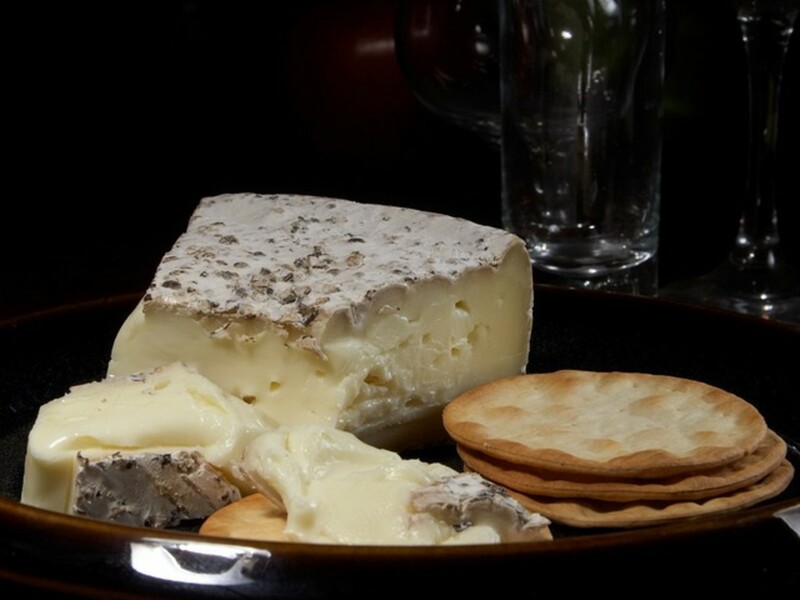 The cheesemaking season shall soon be upon me, so I'd better get the articles up soon! Please let me know how your mozzarella turns out. I've made lots of cultured foods (sourdough bread, kefir, yogurt, sauerkraut) at home but never cheese beyond ricotta (i.e. no rennet). I might have to give it a try! Livelonger, thanks for your encouragement. I always wonder if most people who read my cheese hubs read them out of curiosity, or whether they intend to make cheese. Either way, I'm glad you liked what you saw. Caoshub, I missed responding to your comment for six months! How rude of me! Anyway, thanks for reading, and I'm glad you enjoyed it. 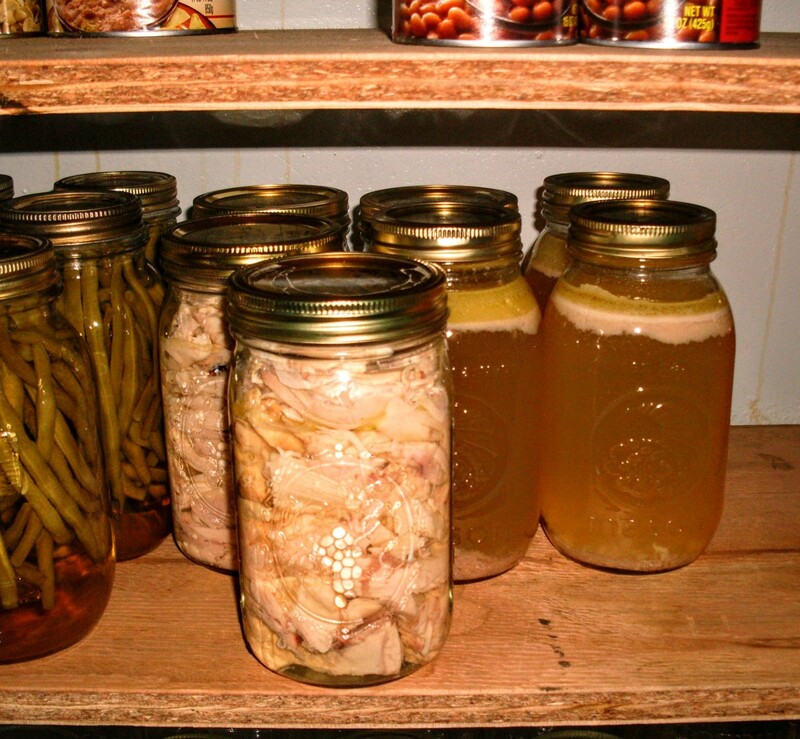 As inspiring as the canning book pictures? Then I've arrived! Hallelujah! 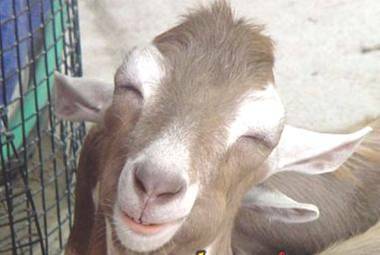 Did you tell the two-year-old that it's a smiling, squinty-eyed goat? ;-) I think it's adorable. Thanks Joy, there is no hurry I can get goats milk anytime. I look forward to reading your hub. So check back in, and thanks for stopping by! After you try the recipe, let me know what you think of it...I have variations, and plan on several more dairy and cheese hubs. Great discription and pictures. Thanks for sharing them. Have you ever made feta cheese? I used to make it all the time when I still had the goats but lost my recipe...I would love to make it again. Do you have a good recipe for it? If yes would you share? Thanks for reading, Christa. Let me know if you act on your desire. Wonderful instructions! I would love to try them. I am working with a large quantity of milk, because that's what I had extra after saving back enough to drink fresh, and making yogurt. You can use whatever quantity you please...you could use a quart if you wanted to, though in my opinion this would yield such a small amount of cheese that it would hardly be worth bothering with. I provided the base measurements of the citric acid and rennet per gallon of milk, because that is the least amount I would bother with. You get roughly 1/5 the amount of bulk in cheese as you started with in milk. Thanks for reading, and let me know if you decide to try this. It's perfectly delicious fresh...I always pinch off a handful and eat it on the spot, after mixing in the salt at the last. Of course, if you wish to be quite professional, you ought to use a brine to salt the cheese, after making it into balls, but I am usually in too much of a hurry, and don't find that it makes much difference when I'm going to freeze most of what I make. This looks great. I've always wanted to make cheese but it looks like quite an ordeal! Plus, this looks like an awful lot of cheese. Is there any way to cut the recipe? Cool hub - love the homemade stuff.